Lortab is a prescription pain medication that contains acetaminophen and hydrocodone. 1 Lortab carries with it the danger of overdose and dependency. Recovering from Lortab overdose can help you or a loved one take the first steps to becoming free of chemical dependency. If you notice any combination of these symptoms in your loved one or if you may be at risk for a Lortab overdose yourself, you should seek overdose treatment immediately. No matter how long you have been using Lortab or other hydrocodone drugs, you can always seek help to turn your life around. Call 1-888-319-2606 Who Answers? to speak to one of our trained representatives. 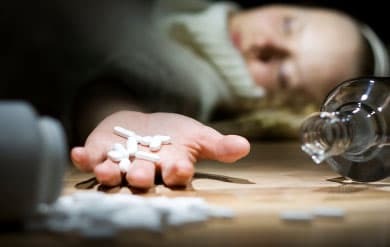 We can give you valuable resources to help you find the best Lortab overdose recovery program in your area. The National Institute on Drug Abuse recommends any of these therapies, but ultimately your treatment will depend on your commitment and which options are best tailored to your recovery. 6 When you find the right Lortab overdose recovery program, you will be able to talk to counselors to make sure that your treatment plan gives you the best possible chance at recovery. Our skilled representatives are on hand 24/7 to take your calls and help you find the ideal treatment program for you and your family. Please call 1-888-319-2606 Who Answers? to begin the recovery process. Recognizing a problem with Lortab is an excellent first step toward rebuilding your life or the life of a loved one. You can change your life today with a quick phone call; it is never too late to get the help that you need for Lortab dependency. Call now.
. Mayo Clinic. Hydrocodone and Acetaminophen (Oral Route), Jan 2016. http://www.mayoclinic.org/drugs-supplements/hydrocodone-and-acetaminophen-oral-route/description/drg-20074089.
. Savage SR, Kirsh KL, and Passik SD. Challenges in Using Opioids to Treat Pain in Persons With Substance Use Disorders. Addict Sci Clin Pract. 2008 Jun; 4(2): 4-25. http://www.ncbi.nlm.nih.gov/pmc/articles/PMC2797112/. .A.D.A.M. Medical Encyclopedia. Atlanta (GA): A.D.A.M., Inc.; Hydrocodone and acetaminophen overdose; MedlinePlus, U.S. National Library of Medicine. 2014. https://www.nlm.nih.gov/medlineplus/ency/article/002670.htm. .Substance Abuse and Mental Health Services Administration. (2009). Results from the 2008 National Survey on Drug Use and Health: National Findings (Office of Applied Studies, NSDUH Series H-36, HHS Publication No. SMA 09-4434). Rockville, MD. http://archive.samhsa.gov/data/NSDUH/2k8nsduh/2k8results.pdf.
. National Institute on Drug Abuse. DrugFacts: Treatment Approachments for Drug Addiction. Jan 2016. http://www.drugabuse.gov/publications/drugfacts/treatment-approaches-drug-addiction.